Sponges may look like plant life, but they are actually animals. These sea-bottom dwellers are very simple multi-cellular creatures. There are various types of sea sponges found on reefs and deep-sea bottoms. Some are loners, while others grow in colonies. They have a very wide range of sizes, shapes and colors. The tube sponge (Callyspongia vaginalis) attaches itself to a reef, which is where it makes its home. This type of sponge is one of the most recognized of all sea sponges because of its tubular shape. It can be very colorful with hues of purple, green, gray or blue. The tube acts like a filter, taking in water from one end and ejecting it out the other. It extracts nutriments out of the water that it filters. The vase sponge (Ircinia campana) resembles a bell in shape. This type of sponge makes its home in the waters of the Caribbean and off the eastern coast of Florida. It attaches to rocks on the sandy bottom of the ocean. The vase sponge can grow to 3 feet high and be as wide as 2 feet. The colors of this sponge are hues of red, brown and purple. The yellow sponge (Cleona celata) makes its home in the Pacific coastal waters of the United States. This type of sponge is not a loner and usually grows in small colonies. It gets its name from its appearance of bright yellow as a predominate feature. It also has hues of orange throughout. This sea sponge is tiny and can be found on a reef encrusting the rocks. The bright red tree sponge (Haliclona compressa) lives in the Caribbean. This type of sponge makes a good pet for your home aquarium. It is relatively small and does not grow much bigger than 8 inches in height. Its color is generally in hues of red. This species will require a moderate flow of water and dim lighting if it is going to live out of its natural habitat. The painted tunicate (Clavelina picta) is a type of sponge that gets its nutriments from the water that it takes in then ejects. Painted tunicates are another type of sponge that grows in colonies. They are very small, growing to only about ¾ inch long. They are translucent in color with red, yellow and purple hues. 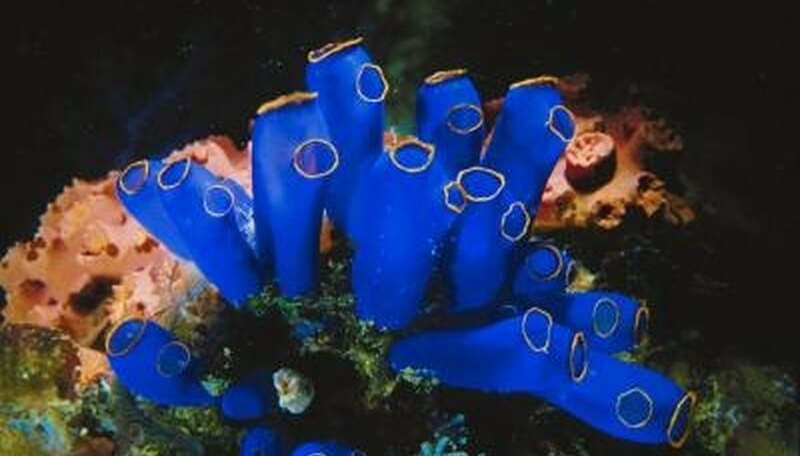 The common sea squirt (Didemnum molle) is another type of sea sponge that is a reef dweller. It makes its home on rocks forming a crust around them. It is usually found in deeper water and grows in large colonies. This type of sponge has a leather look to it. It is bag-shaped and has a spotted exterior and is bright green inside. You will sometimes see these growing on rocks in an aquarium. Zurko, Roz. "Types of Sea Sponges." Sciencing, https://sciencing.com/types-sea-sponges-5384912.html. 24 April 2017.